GOGCCFLAGS="-fPIC -m64 -pthread -fno-caret-diagnostics -Qunused-arguments -fmessage-length=0 -fdebug-prefix-map=/var/folders/dw/wtbd233j0yd8vzjzlfz1wz1w0000gn/T/go-build928352300=/tmp/go-build -gno-record-gcc-switches -fno-common"
This also occurs on Linux with kernel 5.0. I setup a Golang server that pushed 18 files of around 200kB each. When using Chromium, these are all pushed correctly and Chromium can seemingly read all of them. However, when using Java 11's HttpClient, this is not the case. It won't read about 5 (give or take) of the pushed responses. Though, the Java HttpClient will always read them when a different server is used, in my test case I used Node. See their README on how to run them. Kotlin client output with Golang server. Kotlin client output with Node server. All push promises and responses to be read. See the Kotlint client output with the Node server above. Only the push promises are all read, not all of the responses are read. You can see that when you debug the Golang server that the Handler of the http.FileServer is being called for all of them. Though the logs that are printed after http.Handler.ServeHTTP are not printed for the bodies that could not have been read. Though this last one does not occur for all 18 pushes. In the logs it only happens for 10 of them. I would also like to say that with smaller files, it seems to be delivered more often. Though the size of these files is not large at all (about 200kB each). I wonder what happens when these files are multiple MBs. Thank you for this report @AndreasBackx and welcome to the Go project! html := "<html><body><h1>Golang Server Push</h1>"
// 1. Generate the files. // Remember to clean up on exit. // 2. Now run the server. relPublicDir := "/" + publicDir + "/"
// 3. Initiate a request using the HTTP/2.0 Go client. // out with your browser or HTTP clients. I couldn't find any information on there being an HTTP/2 client for Go which is why I was using a Kotlin/Java client. 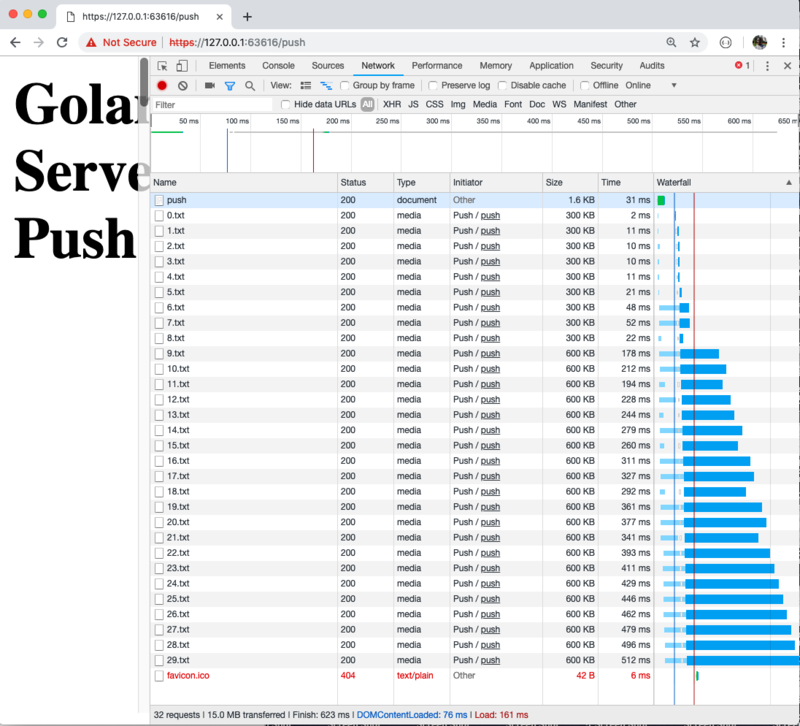 I saw that HTTP2 Server Push was not yet fully supported seemingly #18594 and failed to find any resources regarding it besides the blog post mentioning server-side support. I mentioned in the original issue that Chromium always downloads all of them seemingly correctly. I have experienced the same issue with the Python library hyper instead of the Java client, though I did not include a sample. # Actually meant for client authentication on server side, but it works. The push.get_response() times out when using the Golang client, but works seemingly fine when using the Node server. This was on the latest commit from the development branch. I did include the sample as I thought it would be better to use an HTTP client that was assumed to be stable. Though, it would've been wise to at least mention it that I tried two different clients. You say you added a client in your adaptation, but I don't see any any results from what that did as you only showed Chromium's results? I would like to add that I would not recommend using Hyper for testing the possible bug here as I found that there was a large amount of jitter (up to 1 second) when using Hyper compared to using Java/Kotlin. I could not explain why, but it probably has to do with the fact that the library is not finished and is seemingly no longer being maintained. I did not experience any jitter when using the Java/Kotlin client.